When I made Korean scallion/green onionpancakes/Pajeon, I told you I am going to make the Chinese version of scallion pancakes too. And yes I did make it. 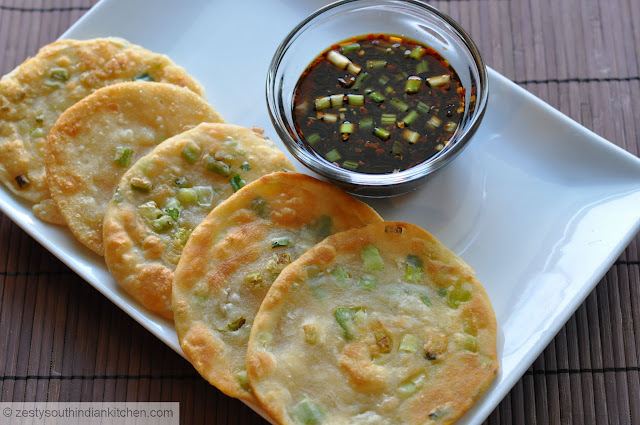 Chinese scallion pancakes is yet another addictive and delicious snack or appetizer. These are famous street food usually served by vendors. I always had an impression that Chinese dish means fried rice or noodle, egg rolls and egg drop soup or hot and sour soup. And Indo-Chinese dishes with the Schezwan Sauce/Sichuan Sauce and Manchurian sauce. However, China is big country and has its own cuisine varies from region to region. Unfortunately we only get to taste only a few Chinese recipes adapted to foreign countries just like Indian cuisine. Indian restaurants serve only few items and menu will same all over the world except in India. According to Wikipedia Chinese scallion / green onion pancake is not leavened savory pancake like our paratha. It may have scant similarities to our paratha; but way of cooking is very different. I was able to find lot of recipes in internet. I liked these three recipes ones from Use real butter, Serious eats and from delicious days. Also watched this YouTube video In this recipe from Appetite for china she is using yeast too. I didn’t use yeast in the recipe. These are made with all purpose flour/Maida. Dough is made with hot water resulting in the breaking down of protein and developing less gluten than cold water dough. Then dough is kept at rest for about 20 minutes and spread into a circle, sprayed with oil and sprinkled with green onion and salt. It is then roll into a long cylinder or tube. Cylinders are cut into small 2 inch-3 inch pieces and rolled it into round disc. You can also make little snails with dough by coiling each single portion of the dough. I found earlier method is easy. Make sure to use All -purpose flour liberally, otherwise it will be sticky mess. Later it is pan-fried using 3 tablespoons of oil in medium heat with constant filliping and pressing. End result will be crispy flaky pancakes. 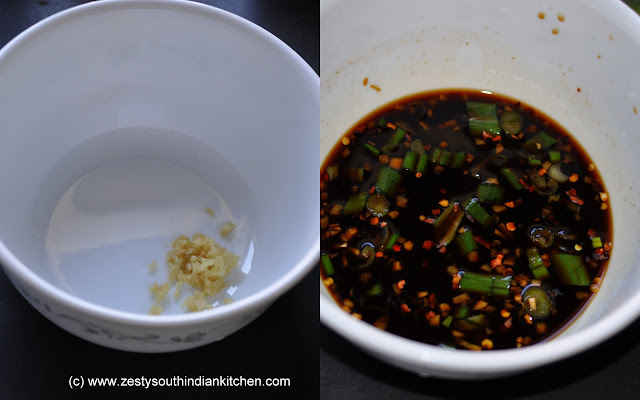 I made ginger-soy dipping sauce to go with it. They are usually served in wedges like pizza slices. I skipped that part and served as such. My hubby and princess fell in love with it. They started eating it even while I am making. I think these are best at when you serve it warm. Next day they lose their little charm, but are still delicious. I made them a few times, and our love for it has increased every time after having a bite. So feel free to use up your scallions/ green onions in refrigerator by converting them into these pancakes. You won’t be disappointed with the outcome. Let start making dough for the pancake. Add warm water to all purpose flour /maida to form a smooth dough and set aside for about 20 minutes. While dough is resting make dipping sauce by combining soy sauce, minced ginger, Worcestershire sauce,rice wine vinegar, brown sugar, chili flakes, and scallions/ green onion and set aside. You can make ahead this sauce . When the dough is ready divide into two equal pieces. Each piece spread as thin as 1/6th inch circle in well floured kitchen table. Then brush the circle with oil and sprinkle salt and green onions. 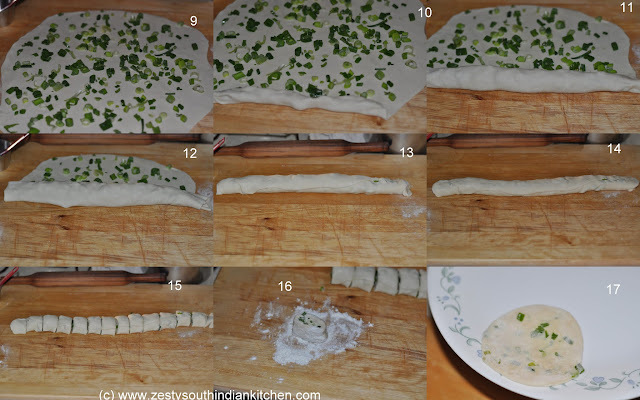 Then gradually starts rolling the dough with green onion from one end to other end. seem the sides. Cut the tube into 2-3 inch pieces, about 11 pieces from one half of the dough. Then press and roll each small cut pieces into thin disc. When you finish making disc, heat oil in the pan and start frying them in medium heat.Until both sides become crisp with brown spots. 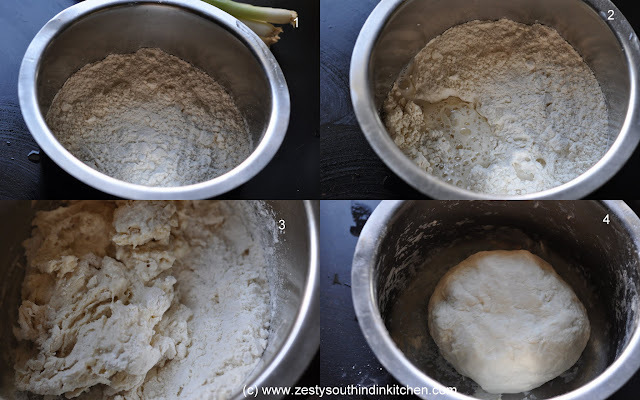 In a medium bowl add flour and gradually add warm water ( tablespoon or so) and mix until it dough pulls away from the sides.Alternatively you can do it in food processor. Knead the dough for about 15 minutes and make it smooth and cover with damp kitchen towel and set aside for about 20 minutes. While dough is resting make the dipping sauce, combine all the ingredients for sauce in a bowl and mix well and set aside. You can make the sauce one ahead too. After 20 minutes in well floured table divide the dough into two equal sized balls. while you are working with one ball of dough make sure to cover the other dough to prevent from sticking. 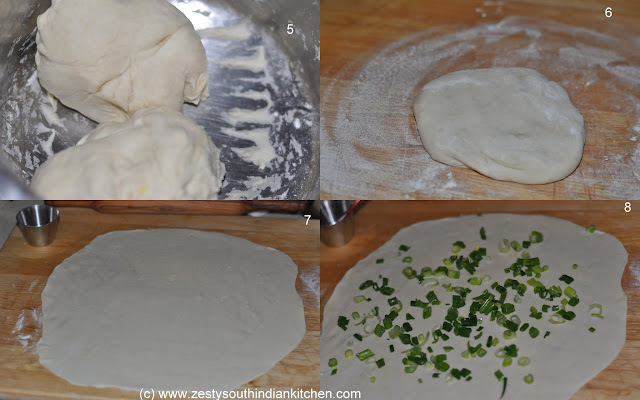 Roll the dough into a thin circle for about ⅙ inch thickness. Brush the dough with a teaspoon of oil. Sprinkle salt evenly all of the pancake. Sprinkle ½ cup green onion/scallions all over the pancake. Roll the pancake from one end like rug and seem the ends. Cut the rolled pancakes into 11 two to three inch pieces. Then spread each pieces into small 5 inch disc. Dust with flour if you find they are sticking to the rolling pen. Heat 3 tablespoon of oil in a skillet to medium heat, and add 4 pancake cook for about 2 minutes on one side or when they started getting brown spots flip the other side and cook for about another two minutes. Make sure to continuously press the dough for uniform cooking. Continue to fry the pancake until you finish the entire dough. Add oil if needed. Remove from the heat and cut into wedges ( I didn’t do that part) enjoy with dipping sauce. Along with green onions you can all sesame seeds. I am linking this delicious pancakes to Hearth and Soul blog Hop hosted here. Delicious looking Chinese pancakes with lovely sauce. Simply droolworthy. Whenever I go for dim sum I ALWAYS get the Scallion Pancakes. They are my favorite! I’m thrilled to have a recipe now that I can make these beauties at home! They look fabulous and I can’t wait to make them! Thanks! 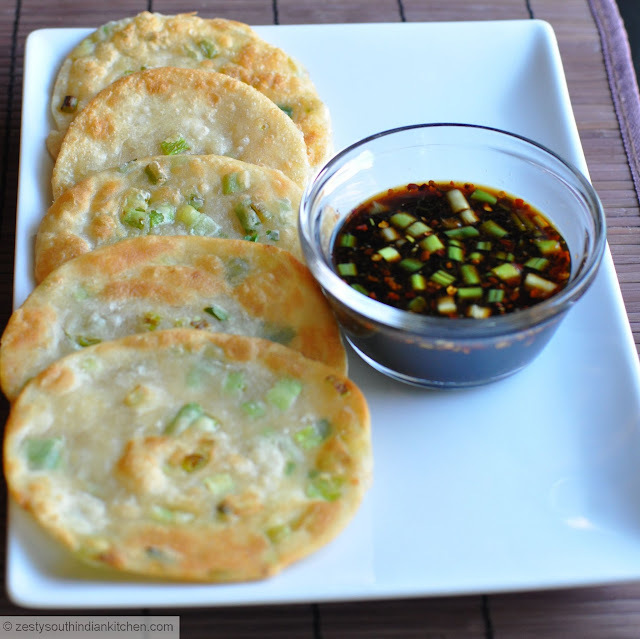 Your scallion pancakes look so delicious, and I love the flavours in the dipping sauce! droolworthy yummilicious and tempting and lip smacking pancakes. 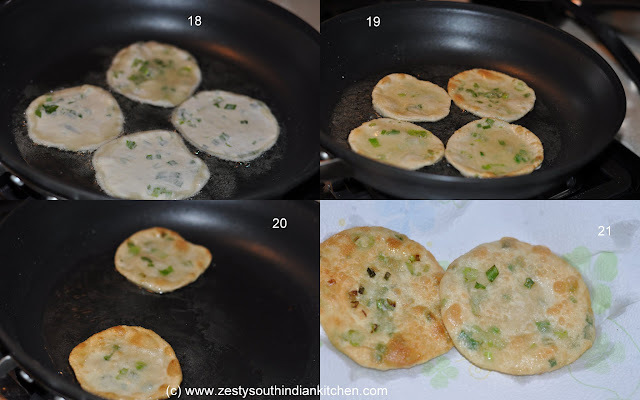 Swathi, I’ve seen these pancakes around quite a few times on others’ blogs…just did not bookmark it (not bloggers we know, just random)…so happy to see these yummy pancakes with the scallions, and the amazing dipping sauce. Wouldn’t you know; I DO have all the ingredients, and don’t even have to buy anything for it. Love how delicious and perfect yours turned out, and will be making it, linking back to you, soon! Thanks for sharing…photos of these yummy pancakes are a great SELLER! I love Pajeon, Swathi! Now I’m looking forward to trying this Chinese version. Looks delicious! wow this is so flaky and sounds so interesting! Pan cakes Looks Delicious !!! Scallion pancakes look crazy delicious Swathi! I’d be swiping them out of the pan too! They’re gorgeous. Those Scallion Pancakes sound and look so delicious. I’ve got to give them a try. Absolutely tempting, looks so crispy, irresistible. loved the sauce combo. New to me…Looks delicious…bookmarking this. Somehow, i wasnt able to make this yummy pancakes eventhough they are in my to do list since a long. beautifully done. This looks absolutely beautiful my friend, crunchy savoury pancakes – yum! Delicious pancakes and yummy dipping…Love it. Its new to me…Sounds interesting and tempting. 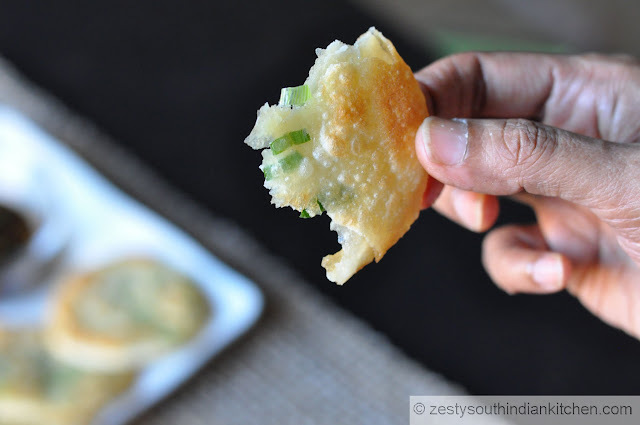 Savory pancakes like these are so irresistible, Swathi…especially with that ginger-soy dipping sauce! Totally delicious! I LOVE green onion pancakes!! I’m bookmarking your recipe so I can give them a try. Would you believe, I’ve never made them? Thanks for sharing! Nalla recipe,different aayirikunnu,thanks for sharing dear..beautiful clicks too. Very different, looks absolutely stunning, bookmarked it..
Hhaha, that’s hilarious, I think I would be eating it while you made it too, I don’t know how you can wait to take a picture, I think they’d be gone before I could take a picture.. These look delicious! I think I could make a whole meal out of these, they look fantastic and I would be eating them all the while i was making them too! Bookmarked. Will let you know when I make it. Right now will drool over your pictures! Very new recipe and dip is interesting specially with worcestershire sauce! I have eaten these when I ate gluten and never thought after that to make it gluten free, now I will. True, they are addictive. oh man these look good, better than any restaurant I have ever ordered from. These pancakes look so YUMMY! Never heard of these before…..sounds really delicious.